2K Drive isn't just a new racing game from the makers of Project Gotham Racing. It's a massive mobile celebration of automotive culture — from the makers of Project Gotham Racing. Coming this fall to iOS as a premium title (hooray, let us pay for things already! ), 2K Drive is going to give the likes of Real Racing 3 and Gameloft's upcoming Asphalt 8: Airborne a real run for their money. The screenshot at the top says it all: this isn't just a game about shiny red cars. There are plenty of those, licensed and original (scroll down), but there's also muddy pickup trucks. Lucid Games, a studio created by senior developers at PGR studio Bizarre Creations, is crafting the enthusiasts dream mobile game. 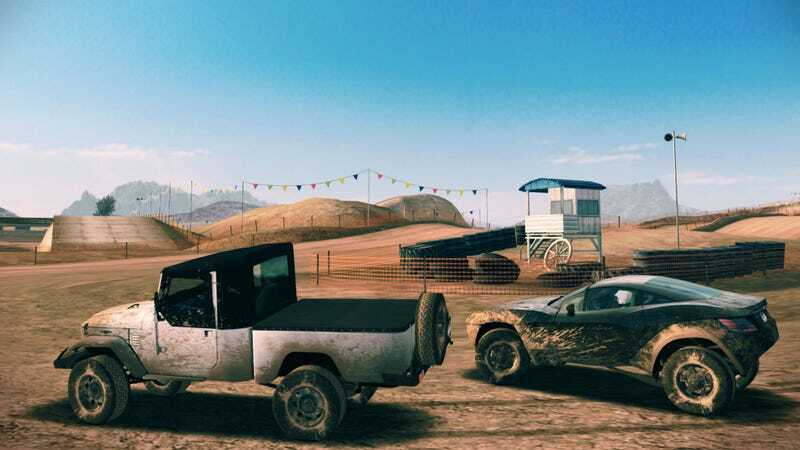 There's street racing, drag racing, track racing, off-road racing, and a bunch of driving mini-games. They've got cars from Dodge, Fiat, Ford, GM, Icon, Local Motors, Mazda, McLaren, Nissan and So-Cal. I've never even heard of some of those. 2K Drive will be a hub for mobile news as well as mobile racing, with a cover page that pulls news from popular automotive blogs and publications, allowing users to like and share news. All this, from the folks that made what some consider the greatest racing video game series ever. Count me me. 2K Drive is coming this fall to iOS devices. Love the pretty pictures.